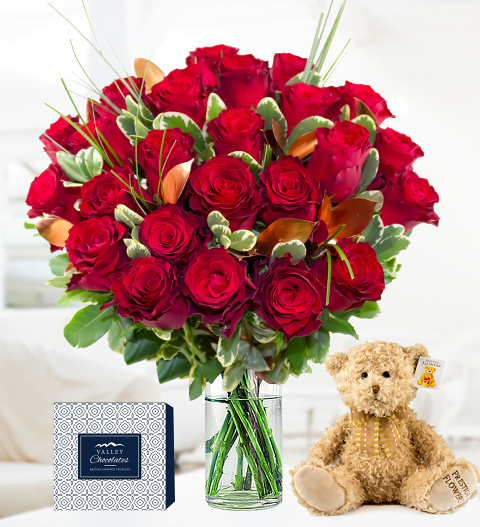 This beautiful Valentine's bouquet is made up of 24 luxury Red Roses, complimented with copper ruscus and a selection of greenery including bear grass. To make this the perfect Valentine's gift we have included a box of chocolates and a cute bear! Send this luxury Valentine's flower gift to your loved one this Valentine's Day - it's guaranteed to make them smile! This sturdy, long lasting Rhodos Red Rose comes with an average head size of 5cm.